The key to a well running and long lasting heating and cooling system is to keep up with regular maintenance of the entire system. This includes making sure that you perform a duct cleaning at least once a year. Even though they are out of sight and it is easy to forget about them, the ducts are a vital part of getting clean hot and cold air delivered into your home. Without a regular cleaning schedule a buildup of dirt, hair, and grime begins to collect on the inside of the ducts. Over time this will be blown out into the home which can cause symptoms related to allergies, asthma, and the common cold. The only way to make sure that the ducts that run throughout the bones of the entire house is to bring in a professional heating and air-conditioning company that specializes in duct cleaning. During the duct cleaning process, the insides of all of the pathways that deliver hot and cold air are cleaned so that dirt and hair are dislodged and removed from them. During the cleaning, all of the registers and their covers should also be cleaned, as should the supply and return air ducts. When you are calling to book a professional cleaning, make sure that you specify which parts of the home are included in the duct cleaning in order to be sure that something is not left out. Sometimes heating repair companies will not include the duct covers until they are specifically asked to. It is also recommended that you are at home during the cleaning, so that you can speak with the cleaners and find out if there are any potential issues that are spotted in the duct system. 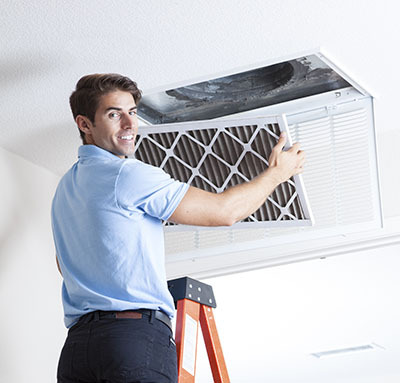 If you or the duct cleaners find any kind of condensation on the inner parts of the ducts, then that is a sign that you might have a serious issue in your ducts. The combination of water and dust in your system can quickly lead to the creation and spread of mold, which can be hard to get rid of once it starts. It can also lead to serious health problems in your family. Water should never be present in your ducts, so if you happen to see it there, make sure to call in your air conditioning and heating repair service. Since ducts are hidden from the residents of a home, it can be easy to forget about them or assume that as long as heat and cold air are being pumped out on demand that everything is working fine, but in order to keep a small problem from becoming a huge expensive one. If you are reading this and you can not remember the last time that you scheduled a cleaning for your air ducts, then you are probably overdue for one. If you have recently bought a house and did not receive a receipt from the previous owner showing when the last cleaning was, then it is a good idea to schedule one. ← The number of private and commercial water purification systems in the US is on the rise.